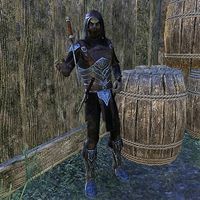 Terilar is a Dunmer assassin who can be found in Vivec City. You can find him in a dark alcove behind Foundation's Embrace spinning his dagger, constantly ready to attack. He cannot be spoken to. This page was last modified on 22 November 2018, at 03:36.